Urban Funk Live at The Music Café! Urban Funk performs for a demanding and appreciative audience. Urban Funk returns to the New Deal Café in Greenbelt Maryland. Featuring Guest Drummer Pete Ragusa! The hits of the 70's , strong R&B roots with a layer of Funk, we will be kickin it! Urban Funk returns to The Music Cafe! Urban Funk looks forward to their return to The Music Café. The comfortable environment, hospitable host, and delicious fare is the perfect environment to enjoy some great music. Urban Funk brings their delicious brew of unmistakable Funk and brings on the groove that brings the guest to their feet! Urban Funk Live at Veterans Park Bethesda! At the intersections of Norfolk, Fairmont and Woodmont Avenues in the heart of Bethesda Maryland! Urban Funk for their first show of 2017 will be at Villain and Saint. It is always a fun evening at Villain and Saint, with great food, a nice dance floor and drink specials. Plenty of parking and easy access in a busy Bethesda neighborhood. The Takoma Park Street Festival in it's 35th Year, returns with the promise of great weather after last years wash out! The Takoma Park Street Festival takes place on a mile stretch of Carroll Avenue in Takoma Park, MD, to Carroll Street NW in Takoma, DC, with over 200 artisans, community groups, children’s activities, food vendors, and a variety of green companies. The festival has three stages that host 18 popular, local bands performing music from indie folk, rock, blues, country, reggae, and everything in between. FREE ADMISSION! Shoppers will find paintings, photographs, pottery, silk-screening, soaps, stained glass, jewelry, woodworking, textiles, ceramics, kids’ items and much more! Kids also love the festival with its crafts, face painting, inflatables and MORE! The Brand New Watkins Mill Town Center Summer Concert Series is a new entertainment series showcasing the best in local talent in their brand new town center featuring beautiful new shops, apartments and entertaining parks. Urban Funk goes on at 6 and will play until 9:00 PM. Urban Funk performs live at The Taste of Wheaton 2016. Located at the Wheaton Triangle at Grandview and Reedie Drive. A block up from the Wheaton Metro. Featuring taste from all the local resturaunts, live music and more! Urban Funk Live at Sehkraft Brewing. Arlingtons newest and greatest Music Venue and Brew Pub! Currently listed as a Private Event. A special private event, by invitation only. Urban Funk plans to shake up Bethesda for a Spring Spectacular of Funk, R&B, and Classic Rock. The dance floor was full last time, and we will be pulling the tables back to make more room yet! In the heart of the Christmas Season, Urban Funk will bring you gifts of joy! Hear your favorites, performed by your favorites in a friendly atmosphere of hospitality and service. Urban Funk Live in The Race Bar at Clydes of Chevy Chase! Dance to the downtown funk of Washington's main stay of 70's groove hits. Hear the classics of Marvin Gaye, The Commodores, The Spinners, James Brown, Chuck Brown and many more. Special guest appearance Dave Chappell,local guitar virtuoso who will kick it up a notch and have the fans clamoring for a front stage view. Urban Funk Live at Villain and Saint in Bethesda Maryland. The Bethesda Summer Concert Series sponsored by the Bethesda Urban Partnership featuring Urban Funk on June 25th at 6:00 PM! Bring your blankets and picnic baskets , this is a summer classic that is enjoyed by all. Join Urban Funk on the Dance Floor for a entertaining night of musical delight and dancing fever! Our headlining musicians are a special treat and have their own followings and fans, yours for the choosing! Join Tommy Lepson, Dave Chappell, Wayne Sulc, Steve Long, Mike Davis, Gary Crockett and Tim Cutrona for a groove filled evening of 70's hits and Jazz classics. Join Urban Funk on JV's new stage for the Cherry Blossom Count Down! Urban Funk tries its licks in the Funkiest part of town. Join us at the Tree House Lounge as we throw it down, and light up the dance floor! The Music Café and Sharon Johnson are sponsoring a Gemmell Family Benefit concert on Sunday February 22nd at 5:30 PM. Times may vary, so please check their web site. Urban Funk is scheduled at 5:30 , and is grateful to be part of this effort. The Gemmell Family was tragically affected by the jet crash in Gaithersburg and will have continued needs. Thank you for your generous donation, and particiapating in this event. Urban Funk's Home for The Holidays Preview Show! Its the week before the week before Thanksgiving and Urban Funk wants to be the first to Thank You! Join us at the Venerable JV's, we expect the new listening room to be completed with added square footage and sonic space to enjoy the great sounds of Urban Funk! It's cooling off now, so its time to heat it up one more time at Clydes of Chevy Chase Race Bar! Urban Funk performs your favorite dance time hits from the 70's! As the leaves turn to golden splendor Urban Funk stokes the fire and heats up the dance floor for fun filled night of dancing and musical delight! Join Urban Funk for a Back to School Funk Dance Party at the historical Bethesda Blues and Jazz Supper Club! Join Urban Funk for a Dog Days Dance at the scrumptious Music Café in pastoral Damascus Maryland! The music starts at 8:00 PM and goes to 11:00 PM. See Urban Funk Live at The Motor Bar at Clydes of Chevy Chase! The best place, the best food, with the best Music! Urban Funk lays down the groove and heats up the dance floor on one of the hottest days of the summer! Town of Herndon Parks and Recreation Department is preparing to host the largest free event in Northern Virginia - the 34th Annual Herndon Festival in historic downtown Herndon, Virginia May 29-June 1, 2014. This is a town-wide event and attracts over 80,000 people from the greater Washington, D.C. Metropolitan area. There is no admission fee to enter the Herndon Festival. If you would like to be part of the Herndon Festival, click here for more information. 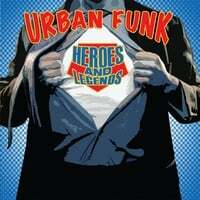 Since their release of Heroes and Legends in 2010, Urban Funk has been performing in the Metropolitan region to critical acclaim. Showcasing the dance chart hits of the 70’s; this venerable period of music is the stepping stone for every performance. Whether it is James Brown, Marvin Gaye, or WAR; the hits keep coming and the lawn is guaranteed to be filled with a dancing crowd. Wayne Sulc and Tommy Lepson front this group along with the funk fusion sound of a rhythm section featuring Steve Long on Keys, Mike Davis on Bass, Gary Crockett on Drums, and Tim Cutrona on Percussion. With a home base at Clydes of Chevy Chase, Urban Funk has also performed at The Smithsonian Museum of American Art, The Hamilton, Mason District Park, JV’s, The Music Café, with more to come. Urban Funk presents it's Rolling Thunder Spectacular! Featuring the grooves of the times with the sounds of WAR, Curtis Mayfield, Joe Cocker, Rolling Stones and James Brown! Join us May 23rd as Rolling Thunder kicks off at JV's. Long known for being Washington's Rolling Thunder Headquarters, JV's Honors our Vets and MIA"s and Urban Funk is proud to be part of this long tradition. Urban Funk rolls into their favoritest venue in Chevy Chase! The Race Bar at Clydes of Chevy Chase! Get your race cloth's on, and rev your engines for a fun filled night of classic Funk , Rhythm and Blues! Urban Funk performs at The New Deal Café! One of the newest venues in the area, and a fresh offering in Greenbelt Maryland, the New Deal Café is known for their distinctive taste and flavorings. Hear your favorite Funk Hits of the 70's played by some of Washington's Heroes! Urban Funk plants the Funk seed! Its planting season, and Urban Funk has the seed of the Funk! The Jolly Green Giant has nothing on us, and Johnny will be dancing to a whole new beat. Come out and join us on this fabulous Spring Day in beautiful downtown Damascus! Urban Funk Live in Georgetown! Performing at the newest club in DC! Bringing back the good ole days of Georgetown! Urban Funk performs the tunes from the era of Georgetown's Hay Day! Special Guest Multi Wammy Winner Dave Chappelle will be joining us on Guitar! Urban Funk Returns to the Lorraine's Legendary JV's. Our first show of 2014 will be at JV's World Famous Listening Room. Come hear the big sound of Urban Funk in an intimate setting of friends! Urban Funk performs from the song book of the 70's. The season starts early with Urban Funk at the helm. Join us at Clydes Race Bar in Chevy Chase with friends and family for a great time! Urban Funk is back by popular demand! Urban Funk takes on Rt. 50 and pulls up to JV"s for a smoldering dance fest! Urban Funk's famous Funk Bus comes loaded! Takoma Park Maryland celebrates their annual Folk Festival and features the Funk of Urban Funk! Funk is Folk celebrating Personal Struggle, Social Commentary and Hope! Urban Funk cools off in the Race Bar at Clydes of Chevy Chase during the Dog Days of Summer. Join us August 16th for a bone chilling throw down. Mount Vernon Nights at the Grist Mill Park in Alexandria next door to historical Mt Vernon Plantation. The Funk Bus needs it's maintenance and there is no better place than the Music Cafe in Damascus Maryland! A hot spot in the Washington Music Scene, The Music Café has and continues to host the metropolitan areas finest musicians. Urban Funk is looking forward to making their premier appearance in this venerable venue! Great Eats, and Satisfying Drinks! Urban Funk is looking for some country love in beautiful Chantilly Virginia! The fabulous Sullys of Chantilly has graciously invited us to bring the Funk to the x burbs. Known for their great food, talented staff and amazing sound and lights, Sully's dance floor is the icing on the cake and a great place to get down and funky loose. Urban Funk lays down the beat with uncomprimising character!